A tall, rangy lock, Kellock made his Scotland debut in a non-cap match against Queensland in 2004 but was made to wait until the Wallabies' visit to Murrayfield later that year for a maiden Test cap. The following year he made the switch from Edinburgh to Glasgow, where he was appointed Warriors captain. In 2009 he assumed the Scotland captaincy in a famous win over Australia following an injury to Chris Cusiter and also took the leadership duties on their victorious tour of Argentina in June 2010. He missed the November internationals that year but returned as captain for Scotland's Six Nations campaign in 2011. He was hampered by a serious knee injury in the wake of that tour but was named Scotland skipper for the Six Nations on his return to action. Kellock had previously represented Scotland at Under-19 and Under-21 level and was also a member of the Scotland 'A' squad that won the IRB Nations Cup in 2009. And Kellock continuted his comeback for Glasgow before being given the final two months of the season off to rest by Scotland boss Andy Robinson. 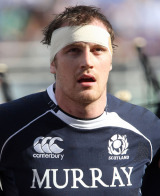 Kellock will captain the national side into the 2011 World Cup.